Remove the ham from its Cryovac packaging. Wipe away any grease from the leg. Identify any areas that may have oxidized and check for pockets of rancid fat (this does not mean the whole leg is tainted – only the immediate surrounding area) and trim them away. Be careful to cut away only the skin of the area you plan to slice, making sure not to trim away too much of the fat to avoid impacting the flavor and your bottom line. 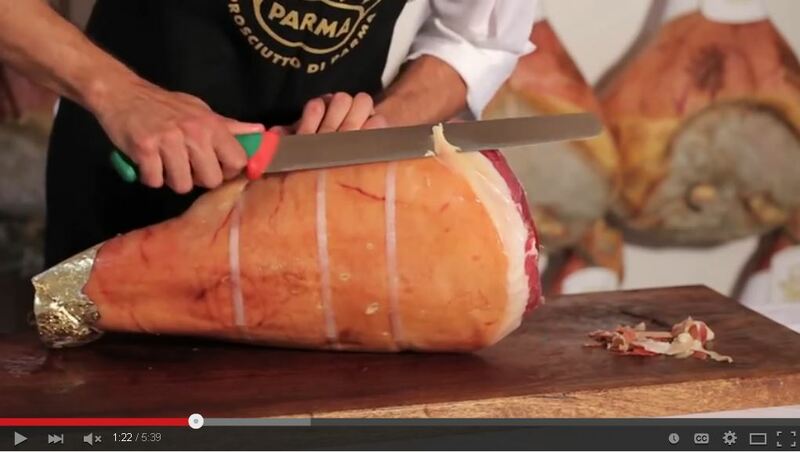 Prosciutto di Parma is meant to be served with a ring of fat around each slice. Leave a layer of 1-1 1⁄2 inch thickness. If customers prefer less fat, leave at least a 1⁄2 inch ring of fat – this lends essential flavor and helps keep slices fresh. Always slice Prosciutto di Parma to order – never in advance. Unless directly specified, it should be sliced paper thin – no more than 1/16th of an inch. Ideally, it should be translucent when held up to light. When packaging sliced product for customers, place slices side by side, slightly overlapping, and place paper in between layers to prevent them from sticking together. Thicker slices of 1⁄4 inch are used when a recipe calls for diced or julienned pieces. Maximize your yield with the small end of the ham, which is ideal for this purpose and can be used in your prepared foods or wrapped and sold for soups and risottos. 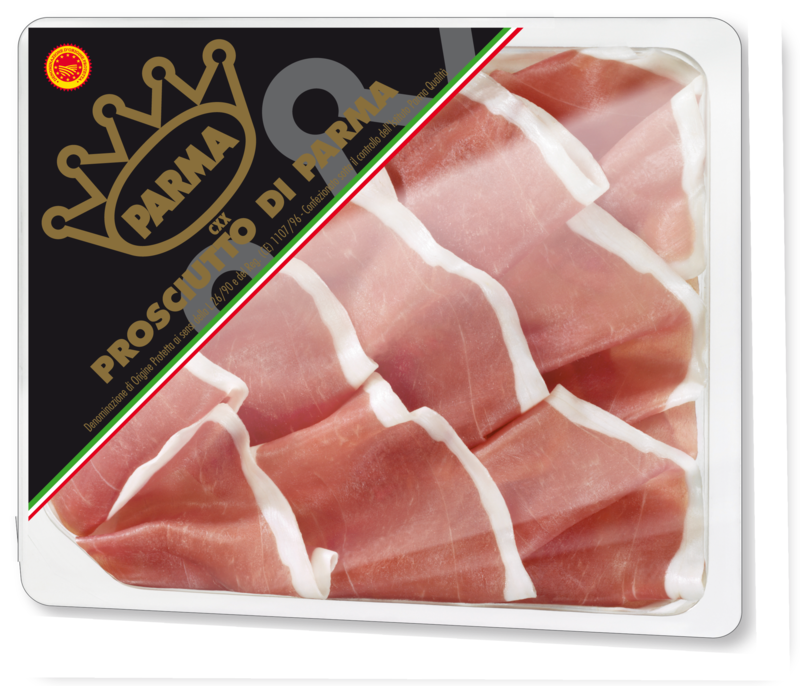 A boneless Prosciutto di Parma can be stored in its vacuum pack up to 12 months, refrigerated at 40 ̊F to 42 ̊F. 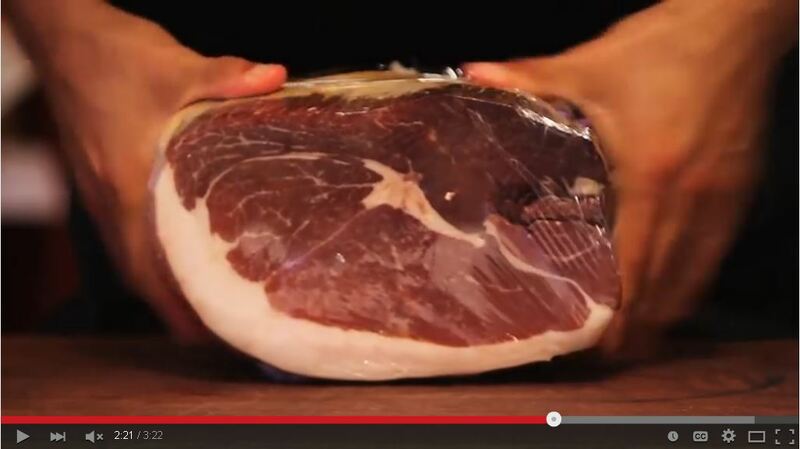 Once the vacuum seal is broken and slicing begins, the ham can be held under refrigeration up to 40 days. Freezing is not recommended. After slicing, cover the cut surface tightly with plastic wrap and refrigerate. Train employees to manage inventory in your deli case to reduce loss and customer disappointment. 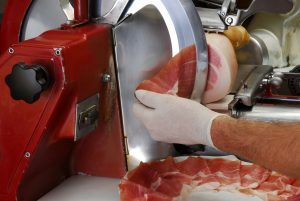 Remove only one leg at a time and return it to the same location to avoid confusion with different ages of Prosciutto di Parma or with other prosciuttos. If you carry packaged pre-sliced product you can direct customers to Prosciutto di Parma by telling them to look for the gold Parma Crown located on a black triangle in the upper left corner of the package.